The largest island on the East Coast of Australia and the largest sand island in the world. 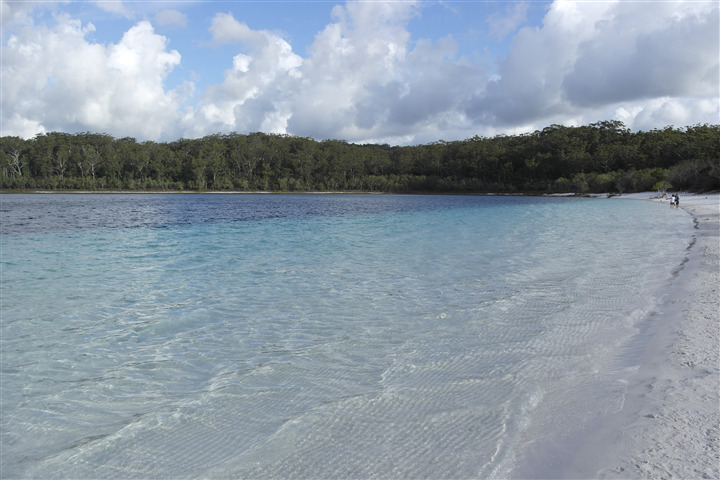 Fraser Island has been included in the UNESCO heritage since 1992. The island is easily accessible from Hervey Bay, about 300 km north of Brisbane. Only four-wheel drive vehicles are allowed on the island. You can either decide to rent a car (better if shared with other people due to the high cost of renting and permissions needed to enter the island) or to purchase an organized tour through the tourist information centre. We decide to go first for a 1-day tour on the more popular East coast of the island, and then for another 1-day tour on the western coast. We choose to buy the first tour with Fraser Experience company for 180 AUD per person and the second one with Tasman Venture company for 170 AUD per person. These are the cheapest tours currently available on the market (no, it’s not a joke!). Both excursions provide transfer from your accommodation to the harbour at around 6.30am. We stayed at the Scarness Caravan Park, a really nice camping just on the beach for only 15 AUD per vehicle per night. For the excursion on the east coast, we use a four-wheel drive bus able to go on sand dunes. Indeed, the 90% of the route takes place directly on the beach - called 75 miles - which literally acts as a highway and even a landing track for small tourist aircraft. Our group consisted of 17 people plus the driver who was also the tourist guide. The first stop is Central Station. It is located in the middle of the forest and represents the only residual proof left by early civilization once living in this area. Next stop is Eli Creek, the largest brook on the island where you can even swim, followed by the Coloured Sands, typical sandy and red mountains on the island. The final stop is the McKenzie Lake, probably the most famous place here thanks to its crystal clear waters and pure and white sand. Our feeling is that of a quite heavy day on sand dunes, full of tourists everywhere; a very bad packed lunch and landscapes not that far from those seen so far. In conclusion, we are a bit disappointed if considering the value of money for the tour purchased. The following day is the turn of the west coast. This side of the coast is hardly accessible by land because of the extremely pure sand in which it is easy to sink if with a heavy vehicle. That is why we leave Hervey Harbour directly with a small boat. We are in total 8 people in addition to 3 crew members. They immediately offer us tea or coffee to warm up a little bit after the rainstorm. As soon as we reach the west coast of the island, we have the feeling to be on a completely different island! Extremely peaceful full of white beaches, wild nature and not even one single person but us!! Actually, this company is the only one organizing tours on this side of the island, still unknown by most of the people. During the day we approach the coast several times through a smaller boat: first at Bowarrady, then at Awinya and finally at Wathumba Creek. The landscape is truly amazing: a never-ending succession of white and soft sand dunes, fresh and pure water streams, wild and unspoiled vegetation and a sea of an infinite variety of colours. Moreover, the tour includes kayaking among the mangroves, water sports and snorkelling with relevant equipment and competent staff as well as lunch and fresh fruit served on board. In short, it is a unique and exciting experience that can give you the opportunity to explore the true beauty of this island. We therefore strongly recommend visiting the west coast of Fraser Island and feeling a bit like the main character in an episode of "Lost"!